The 'Rocket Man' hitmaker used to enjoy hanging out with the late Beatles legend - whose last public performance came with Elton in New York's Madison Square Gardens in 1974 - but admits he was wary of his "abrasive" humour, though he only ever saw the "kind" side of his pal. He said: "We got on like a house on fire. We hung out for a couple of years. "[I don't know why we got on so well] Sense of humour? I found him very kind, very funny, I don't know why we clicked by we did, and he clicked with my band and the people around me. And we had so much fun. "I was quite intimidated by him because I knew he was razor sharp and could be abrasive, but that side of him never came out with me, only the kind side and the funny side." Elton was also intimidated when he worked with one of his performing idols, the late Nina Simone, when she sang at Sting and wife Trudy Styler's biannual Rock the Rainforest gig at New York's Carnegie Hall in 2002. "Trudy said, 'Shall we have Nina Simone, she's a bit of a trouble?' and I said, You've got to have her, assign her to me. I'll look after her'. "Patti LaBelle and I looked after her and she couldn't have been any sweeter. I was so intimidated by her, but she was so lovely. "She came on and said 'Come on, give me my hand'. She'd had a stroke but she sang 'Here Comes the Sun' and she melted my heart. "At the end of the evening, she sat in the chair and cried because she got a standing ovation. And I'll never forget it but she never played again but I will treasure it. I was running over giving her kleenex and stuff like that, I was her maid in waiting for the evening, but I was so honoured to be on the same bill as she was." 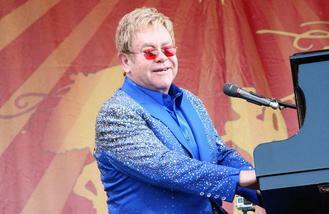 Elton believes Nina - who passed away in 2003 aged 70 - is the "greatest artist of the 20th century". Speaking on BBC 6 Music, he said: "For me, she was the greatest artist of the 20th century, forget the Beatles and the Stones, forget Dylan, Presley, any of them, Sinatra, Louis Armstrong, Nina Simone walks all over them."